Since Venus is closer to Earth than Mars — both in size and distance — it would be a much more convenient candidate for manned exploration. There’s just a slight hitch: the average temperature is 850 degrees F, and the atmosphere is 90 times denser than ours. In other words, you’d die in the opposite way that Quaid nearly did in Total Recall. Probes have been sent to the planet’s surface, but the Russian Venera 13 survived the longest at just 127 minutes in 1982. As it does, NASA has figured a way around all that. In IEEE Spectrum, it outlined a study called HAVOC to build a floating “city” of astronaut-manned zeppelins that would hover 30 miles above the planet. At such an altitude, the pressure would be the same as Earth’s at sea level and the temperature would be a still scorching, but manageable 165 degrees F. What’s more, radiation levels would be much less than those on Mars — about the same as Canada gets. The travel length would also be much shorter, solar power would be plentiful, the atmosphere is extremely buoyant for blimps and there would be an option to abort the mission early and return home. After a risky arrival, where the goal is most definitely to not land, astronauts would be able stay for 30 days in 400-foot blimps powered by 10,000 square feet of solar panels. Venus remains one of the least studied planets in our solar system, so scientists could learn about the planet’s runaway greenhouse effect and study its highly acidic atmosphere. 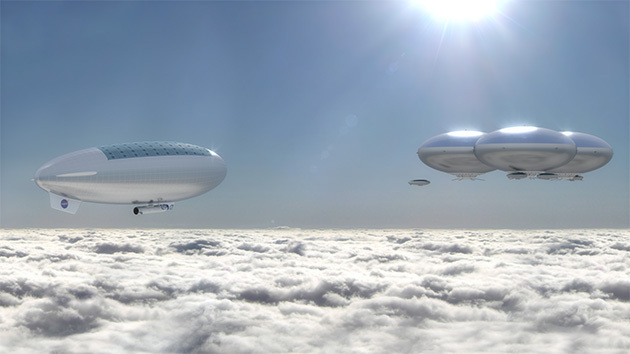 The airships could also bring robotic landers to study the soil and other factors on the surface.